The company has been selected by a panel of judges as ‘The best of the best’ in the international cosmetics industry. It has raised more than 21.000 euros in the crowdfunding campaign used for the launch of the large-scale production of the device. 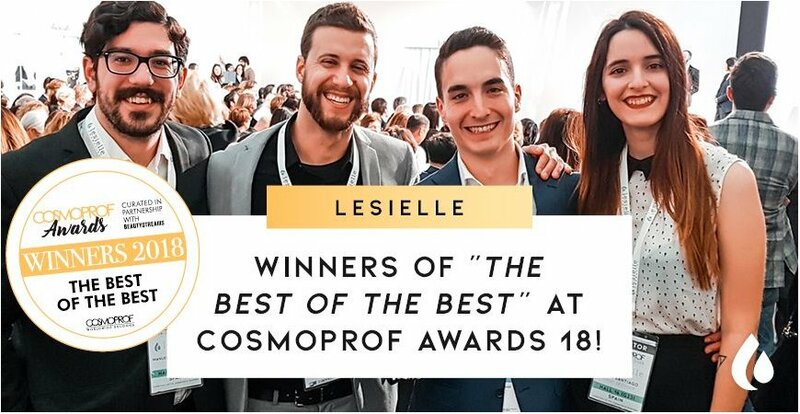 March 19 2018.- Lesielle Cosmetics, the finalist company among 582 candidates from all over the world in the Cosmoprof Awards has won “The best of the best” award, which recognizes the most innovative product in the cosmetics industry. These awards, the most prestigious in the beauty industry, have been given out this weekend at the Cosmoprof Worldwide Bolonia 2018 (Italy), a benchmark event that brings together the most innovative companies and products on the market. This company has created the world's first adaptive skin care, a new generation of personalized creams with no delays that changes according to the user's skin and the environmental conditions. Lesielle’s device allows men and women of any age to create the skin care adapted to their needs just by pressing a button and they can do it at home. Thanks to an isolated formula of bases and active ingredients, it is possible to change the treatment to adapt it to you at any time. It is also “an affordably priced skin care for everyone, which is one of the Lesielle’s main values” affirm its founders Rubén Rubiales and Alberto Portillo. The recognition obtained at Cosmoprof Worldwide Bologna 2018 combines with the successful financing of the international crowdfunding campaign on the Kickstarter platform which ended on March 19 with more than 180 sponsors from all over the world. After collecting more than € 21,000 for the mass production of the device, the Lesielle system will be available in the market in the fall of 2018. Lesielle Cosmetics was selected as the best cosmetics product among 2500 companies and more than 580 products by an international panel of 13 judges from around the cosmetics world. This recognition of “The best of the best” refers to the most prestigious award given to the product that has attracted the attention of the judges the most among the different categories. The company Lesielle Cosmetics, based in Jerez de la Frontera (Cádiz), has already been recognized at a national level for several initiatives. Among them, finalist at the CEPYME Awards, winner of the Andalusian Award for Entrepreneurship for Innovation and recently best project for investments at the Investment Forum of the Andalusia Entrepreneur Foundation. In addition, in 2017 it was one of the 20 Andalusian startups selected from among more than 200 initiatives presented at the Minerva Program for entrepreneurship promoted by the Board of Andalusia and Vodafone Spain.